Recently RTL-SDR.com reader Ilias wrote in to let us know about a post he uploaded to his blog showing how he was able to decode data from a device transmitting at 433 MHz using an RTL-SDR and MATLAB. MATLAB is a technical computing language that can be used for signal analysis and processing. His post clearly explains the steps he took and is a great aide for anyone wanting to learn about decoding simple signals. 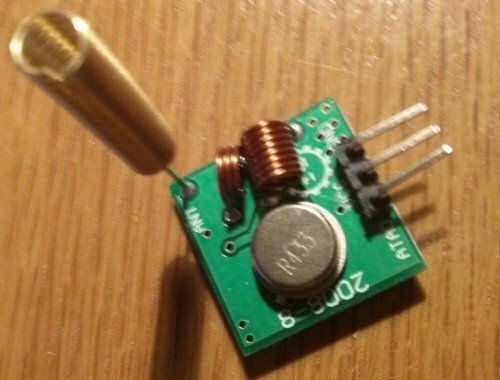 The goal of Ilias’ project was to be able to use the RTL-SDR and MATLAB to uncover the details of a 433 MHz transmitter he bought on Ebay. He wanted to see if he could determine the protocol and recover the data before even looking at the transmitter’s library code. To do this he first used SDR# to record the data sent at 433 MHz. Then by looking at the waveform in the Audacity audio editor he was able to determine that the signal was on-off-key (OOK) modulated and from this knowledge he was able to manually recover the binary string. Next he used MATLAB to create a program that can automatically decode the received OOK signal. His post goes into further detail about the signal processing steps he took in MATLAB. I did something similar with fixed key remotes (tx’ing between 400/433) using the RTLSDR on windows with HDSDR – http://andrewmohawk.com/2012/09/06/hacking-fixed-key-remotes/ , you can use some simple python to decode the signals as well, I found it a bit easier than using something such as matlab.